Size: 6.3" x 3.1" x 0.45"
In addition to this so called "Math Format" mode the calculator sports a traditional "Linear Format" mode. Dismantling the Casio fx-300ES reveals a pretty common construction with a single printed circuit board (PCB). The PCB hides the single-chip calculating circuit under a small protection blob of black epoxy and drives the graphing display with a heat sealed fine-pitch connector. 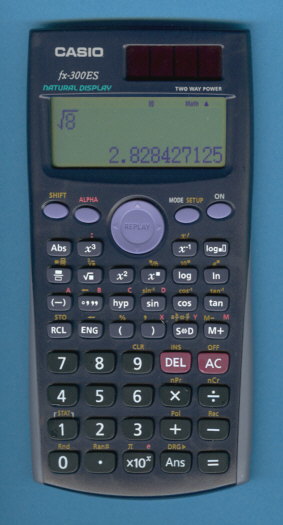 The prominent SR380 designation on the main PCB proves that this calculator was manufacturered by Kinpo Electronics, Inc., a famous company located in Taiwan and doing calculator production for well established companies like Texas Instruments, Hewlett Packard, Casio, Canon and Citizen. Please compare the Casio fx-300ES with its competitors Sharp EL-W535 and Texas Instruments TI-30XS MultiView. © Joerg Woerner, June 8, 2008. No reprints without written permission.